Sometimes, I just want to draw vegetables. Leave a comment below explaining this expression, and I’ll send postcards to my favorites. *First time commenters, don’t panic if I don’t moderate your caption immediately. I’m flaky, but I’ll moderate it soon. I imagine it evaluates to cabbage^2/2 + c. Vegetable integration requires the vegetables to be considered as functions of one another. Functions of vegetables include being delicious in soups, etc. Hmm. The answer \frac12 \cabbage^2 + c is obvious, but assumes that the two green vegetables are equivalent. From here, it looks more like \int \cabbage\,d\sprout, which leads me to wonder what the functional relationship between cabbages and sprouts is. Maybe we could integrate by parts if we had a chopping board. Also, substituting something else for the cabbages seems appealing: I don’t like the flavour much. Are you going to chop that cabbage into infinitely tiny bits? Best slaw ever. 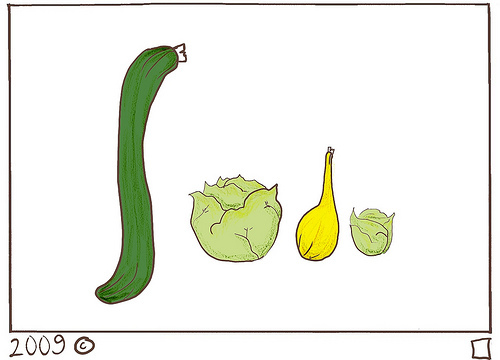 I imagine this integral would evaluate into “squash”-ed cabbage…. wah waaah. I’m agreeing with Joey… it definitely evaluates to (cabbage^2)/2, since it’s the integral of cabbage d(cabbage). Awesome cartoon! We’re going to get a bunch of square sheets of the cabbage, but half of the original thing is going to disappear into thin air after Riemann is done adding them all up! Healthy eating – it all adds up! Integral of cabbage d-cabbage. I agree with Josy (cabbage-squared over 2 plus C). Maybe it’s lettuce (artistic licence, amirite?). Then having a bunch of half-quares of lettuce would be useful for wrapping sandwiches (like the Jimmy Johns “unwich”). I thought it was the integral of head(cabbage) d cabbage. I guess the question is how do we integrate the “head of” function? qwandor, that is incredible…. I think we need a dog combinator… or is that just a dog brush? I read this as lettuce instead of cabbage. Lettuce integrate, and we obtain a salad. It’s “(CABBAGE*cabbage) + C” since CABBAGE is constant with respect to cabbage, which are clearly two different animals, err vegetables. The integral of cabbage is a favorite among beginning analytic chefs. It is occasionally criticized, however, for having one-half the nutritional value of a cruciform product. Plus an arbitrary constant, naturally. Hmm. Apparently I’m not mathy enough. At first glance I read this as the word ‘Soda,’ and was wondering how vegetables imitate it. Ah, I had “Cucumber of Lettuce squash lettuce” Which is similar to V^8, no? Lettuce being 4-d and all..
It’s a good thing cabbages are only kept upright by short stalks; otherwise they might not have compact support. It is clear to me that they are both cabbages, but that the cabbage within the integral is larger than the cabbage in the differential. I would estimate it as having twice the radius of the cabbage in the differential, which we will assume to be the unit cabbage. If we assume the cabbage to be a three-dimensional object, then, if r is the radius of the second cabbage, the radius of the first cabbage is 2r. The volume of the second (or unit) cabbage is 4/3 \pi r^3 (denoted C), while the volume of the first cabbage is is 4/3\pi (2r)^3 = 24/3 \pi r^3 = 8C. Therefore, we have the integral of 8C dC, or 8C^2/2 + constant. Therefore, simplifying this, the result of the integral is 4(cabbage)^2 + constant. “if the juice is worth the squeeze”? While cabbage rounds out any culinary expression, the application of squash integrates it more thoroughly, creating a beautiful square meal. Finish it off by adding a little C salt. I agree that the answer has to be cabbage^2/2 + c, which would be half of the cabbage patch (plus some bugs). The answer is oa+c where c is constant.